The Duncans are an amazgingly sweet family, and I had a great time photographing them, and celebrating their little Keira turning ONE! This was such a fun mother and daughter to work with. 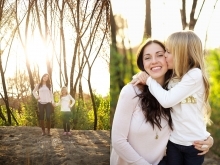 Loren and Addison are so gorgeous, and were perfect models for me! They have such a beautiful bond, and it definitely shows watching them interact. I loved photographing The Lee Family, three generations, the littlest being four months old!